We’ve had plenty of requests for a review of a more professional grade lavalier microphone so let’s have a listen and a look at the Countryman B6. This mic was used in the recent Hobbit movies on Martin Freeman as Bilbo and Ian McKellan as Gandalf. On Martin, two B6s were placed on him, one on each side of his tunic. On Ian, the B6 was hidden in his hat. 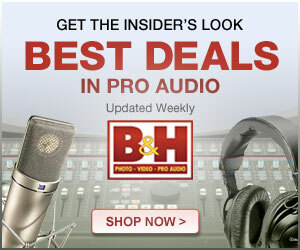 I’d like to thank B&H Photo for providing the mic for us to test over the last month. They’re always great to work with! The Countryman B6 not only sounds great, it is a very versatile option for miking. It comes with three different protective caps that fit over the capsule to provide protection from moisture, but also allow you to sort of fine-tune the sound of the mic. The most common case for this is when you want to hide the mic under the shirt of your talent. In these cases, the shirt will cut some of the high frequency sound. Countryman provides a crisp and super crisp cap to help compensate for that. Of course they also include the flat response cap if you’ll have the mic outside of the clothes.